Duff Quarry Inc. (Huntsville, OH) began a new limestone crushing plant in the spring of 2005 to replace their previous plant, which had been running since 1956. While building and designing this new quarry, James Elder Duff, co-owner of Duff Quarry, focused on creating a state-of-the-art plant. “See, markets change and we wanted to go into something where we had the flexibility to do different things and different sizing,” Duff says. In order to create a flexible, modern plant, Duff Quarry turned to Innovative Processing Solutions, an affiliate of Stedman, who designed and fabricated the automated material handling solutions for the quarry. Innovative Processing Solutions also used Stedman’s Mega-Slam™ and Grand-Slam™ size reduction impact crushers at the new quarry, for limestone crushers. Duff Quarry was started in 1956 by Clayton Elder Duff and his son, James Elder Duff, after the family had been in the sand and gravel business since 1951. Today the quarry provides limestone to areas within a 25-mile radius of Huntsville, Ohio for government applications, housing developments, asphalt facilities, ready mix concrete facilities and other public and privates uses. The quarry has even shipped limestone to California, Beverly, MA, Auburn, NY and Chicago for coal gasification, a process that pressurizes coal and stone to form natural gas. James Elder Duff (Duff) and his two sons James Scott Duff (Scott Duff) and James David Duff (David Duff) are the sole owners of Duff Quarry. The Duff family also owns companies in the ready mix concrete and lumber industries. 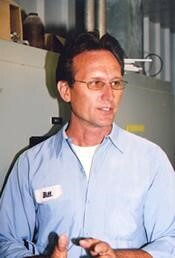 Duff is the owner of Ohio Ready Mix, David and Scott Duff own Ohio Lumber and David Duff is the owner of Mr. Concrete. Duff Quarry also supplies limestone to their Ohio Ready Mix and Mr. Concrete businesses. Duff first learned about Stedman in 1956 or 1957 when the company purchased a Stedman 48” 4-row cage mill to make agricultural lime at their old quarry. At the time, the quarry’s previous equipment wasn’t able to handle the agricultural lime and it was decided to bring in a Stedman cage mill. Duff Quarry also purchased a portable plant, a 4860 Mega-Slam™ crusher, from Stedman for a different location in 1994. “We went to this crusher due to the fact that we felt it was a superior crusher with the portable plant that we were purchasing,” Duff explains. The portable plant allowed Duff to move the crusher to another location if needed. The Duff Quarry team of 12 employees kept the old plant running as the new plant was designed and later installed. The previous quarry was able to produce 600,000 tons of limestone annually, but the original crushers required a lot of maintenance. “I feel as though I’m fair in saying that these Stedman crushers will save 50% of the maintenance that we had in the other plant,” Duff explains. “I say that because the nature of this plant is so much different than the old one because of the welding needed on the crushers. At the old crushing plant we had to weld the crushers every 10 to 15 days.” The welding took about two days to complete, which cost the company hours of labor, not to mention the lost production and higher maintenance costs. Duff Quarry also purchased numerous conveyors, stackers, sensors, controls, vibrating screens, feeders and other equipment through Innovative Processing Solutions, an affiliate company to Stedman who designs and purchases equipment needed to help create an operating processing system. The quarry also received Apex electronics and control systems to create and design a programmable logic controller. Each conveyor at the crushing plant is equipped with terminal strips that are all wired to communicate information to one main processor. “There are too many conveyors for one guy to stand there and say he knows what’s going on. So this brings all of this information together in one place,” explains Bill Page, Maintenance Supervisor at Duff Quarry. 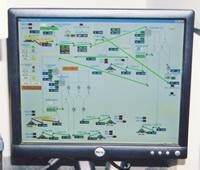 Page worked with Apex in designing the control and information system. Duff Quarry also has the ability to run at full capacity during most weather conditions. The plant was designed to handle and adjust its screening procedure accordingly. “If we had two inches of rain come down tonight we could go in and make full capacity stone,” Duff says. “We could make really large rock and rock from one inch on down in size. This plant is designed with so much capability to do so many different things.” Duff also installed pumps and drain lines under the plant so that the plant cannot flood. 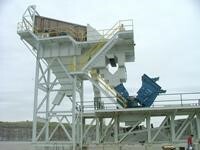 An affiliate of Stedman based in Aurora, IN, Innovative Processing Solutions specializes in custom solutions for bulk material-handling systems. They use equipment from Stedman and other top manufacturers to create a variety of systems, ranging from single processing stations, bins, and conveyors to complete turnkey systems. Innovative Processing Solutions' primary markets include aggregates, industrial, powder, brick, cement, chemical/CPI, detergents and food. Their turnkey design and engineering services included system layout, specification development, equipment procurement and installation supervision.